Khadijah Diggs’ daughter is 8 years old, but she is already training for her first triathlon. She is taking after her mother, who is the only Muslim member of the U.S. triathlon team. And when Diggs’ daughter told her she wanted a race kit that matched her mother’s, the statement nearly brought a tear to Diggs’ eyes. Diggs became a competitive athlete later in life. The single mother of twins competed in her first triathlon in 2012 at age 43, and now aspires to winning a national championship in the Masters division. As she rose through the ranks of the sport and her age class, she struggled to find modest yet competition-approved activewear. That prompted her to begin sewing her own sports hijabs. 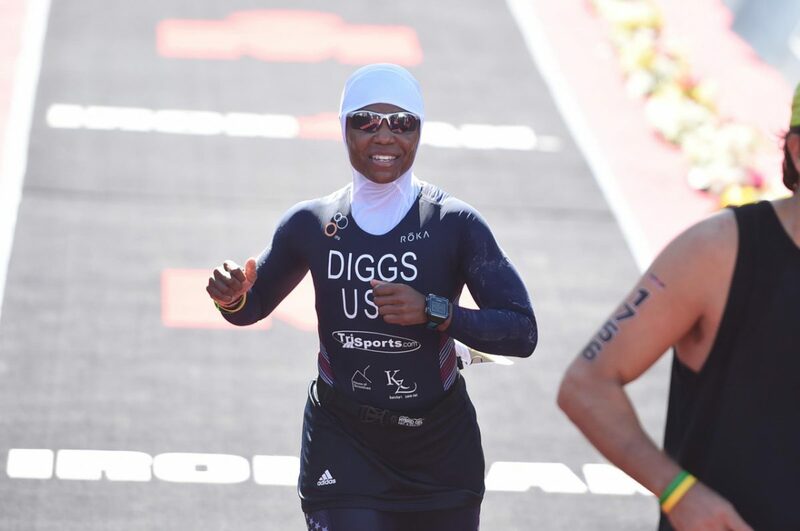 Now, Diggs is among the Muslim female athletes who have partnerships with both a company that makes her hijabs, Asiya, and a company that manufactures the triathlon kits that keep her largely covered to her ankles. The latter company, Peaks Apparel, has helped her lobby triathlon’s governing bodies for rules changes giving Muslim athletes more leeway regarding clothing that reflects their needs. 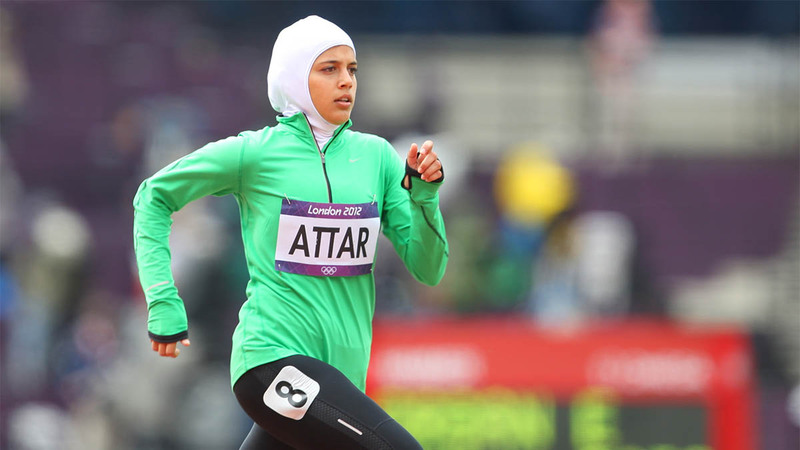 It is part of a new reality for elite Muslim female athletes — one in which they’re being accepted into the mainstream. At the London Olympics in 2012, Saudi Arabia, Qatar and Brunei became the last three countries to send female athletes to the Olympics. At the 2016 Olympics in Rio, 14 Muslim female athletes won medals. 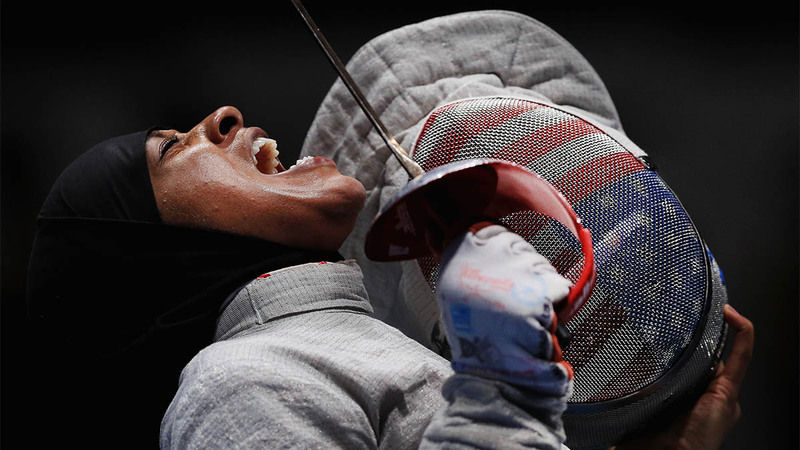 Fencer Ibtihaj Muhammad became the first Muslim-American woman to wear a hijab in Olympic competition en route to winning a bronze medal. Muhammad has become a vocal advocate for Muslim female athletes. “She’s taken on the role of making the space safer for other women,” Arizona State University history professor and sports historian Victoria Jackson said. At the 2020 Olympics in Tokyo, the number of Muslim female athletes will likely shatter records again. Many have already altered perceptions that they merit either scorn or pity. There is, of course, still progress to be made, particularly in Middle Eastern countries where the overarching culture, as well as familial norms, still tend to work against female athletes who aspire to compete at an elite level. But the strides Muslim women have made are tangible, and athletes such as Diggs offer concrete proof of that progress in the outfits they wear. It’s happening in a variety of sports and often in areas where female participation was long frowned upon. 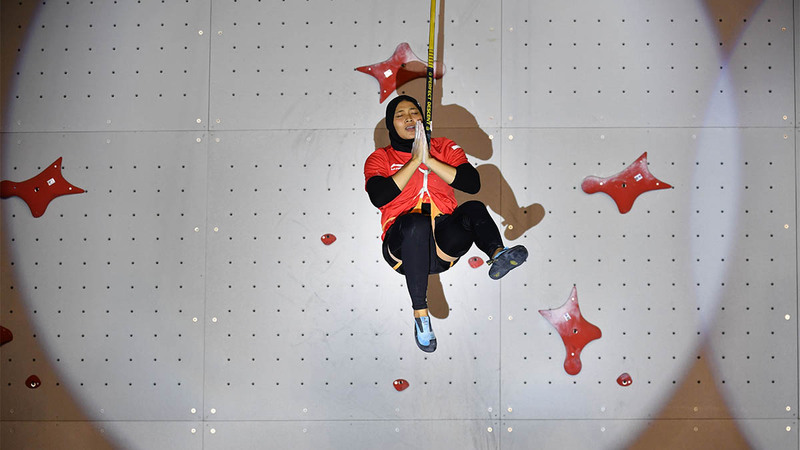 Mainstream sports such as soccer and basketball tend to get the most attention, but Nida Ahmad, a researcher who has studied Muslim female athletes in action sports, points to Australian skateboarder Amar Hadid, Senegalese surfer Khadjou Samba and Indonesian sport-climber Aries Susanti Rahayu — all of whom should have the opportunity to qualify for the 2020 Olympics in Tokyo — as examples of the diversity of participation of Muslim women. Al Haddad began training, in part, to combat the depression she battled as a 19-year-old university student. She became a full-time athlete in 2012, and that year became the first Arab woman to compete in the Reebok CrossFit Games Asia Games in Seoul, South Korea. Eventually, while training out of a home gym she crafted from a storage room in her parents’ Dubai home, she became the first competitive weightlifter from the Persian Gulf region to compete in a hijab. It’s also not unusual for that opprobrium to come from unexpected sources: Diggs said she met a fellow triathlete from Egypt who mentioned her father was supportive of her competing, but her mother wasn’t. At first, Diggs said, that woman’s parents wouldn’t let her train alone at all. Even now, she mostly trains in groups. Yet much has changed during this decade. In 2011, Muslim weightlifter Kulsoom Abdullah challenged the International Weightlifting Federation to gain the right to wear a hijab and a full-body unitard. Soon after, athletes in other sports began doing the same. At the 2016 Olympics, Egypt fielded its first beach volleyball team, and the juxtaposition of their team’s modest outfits with those of Germany, “created conversation pieces about sports, participation, attire and representation,” Ahmad said. Another barrier fell in May of 2017 when FIBA overturned a religious headwear ban that had kept athletes from competing in basketball games on a national level. The governing body did so, in large part, thanks to the longtime efforts of athletes such as Bilqis Abdul-Qaadir and Amsa Elbadawi, some of whom helped start a social-media campaign under the hashtag #FIBAAllowHijab. Earlier this year, as part of its broader societal reforms, Saudi Arabia allowed women to attend sporting events unaccompanied in certain stadiums, and, said Ahmad, women began “taking up leadership positions in various sporting fields,” including becoming members of various governing boards. It remains, said Ahmad, a “broad and complex question” to determine what major issues remain for Muslim women. It depends on the country and on the culture. In a country such as Iran, Ahmad said, progress could mean opening stadiums for women the way Saudi Arabia has begun to do. In the United States, it could mean more access to sports facilities, such as swimming pools, for women who wear the hijab and to increase cultural inclusion. Al Haddad said the “lack of investment in elite Muslim female athletes by elite global players” remains an issue. But as major corporations such as Nike turn their attention to the needs of Muslim female athletes, that could change, too. Jackson said it is also a sign the acceptance of Muslim female athletes has reached a tipping point — Nike even released an ad in 2017 targeted at a Middle Eastern audience that celebrated the empowerment of Muslim female athletes. Some progress has been made through social media, which is one area Ahmad has focused her research. Social media, Ahmad said, “played an important role in enabling athletes to develop relationships with local and regional brands.” It also helped those athletes bring awareness to sports such as surfing or snowboarding that otherwise might not have been popular in their home countries and to humanize those women in ways that extended far beyond faith or gender. The downside, of course, is that social media also subjected the same women to harassment and abuse, including comments about their sport making them manly or proclaiming they’ll burn in hell for their embrace of athletics. For Diggs, competing in triathlons in the hijab has become an opportunity — a way of educating people who might still view her as an outlier or as someone to be pitied rather than someone who has embraced her empowerment. Just as importantly, as Diggs’ daughter embraces both her own athletic pursuits and her mother’s faith, she has more and more role models to look to as she forges her own career. Diggs said her goal is to win a national championship in the triathlon. But she insists she is not just doing it for herself — and she is not even doing it for her daughter.